Bangladesh and India, along with several South East Asian and African nations, are the most vulnerable to climate change, while the United States, Canada and Western Europe are the least vulnerable, according to a recently-published assessment by Standard and Poor credit rating service. The rich industrialized nations which have contribute the most to climate change are the least vulnerable to its disastrous effects now. The report says Pakistan and China are relatively less vulnerable than India and Bangladesh. There are two basic reasons why poor countries are bearing the brunt of climate change: geography and poverty. 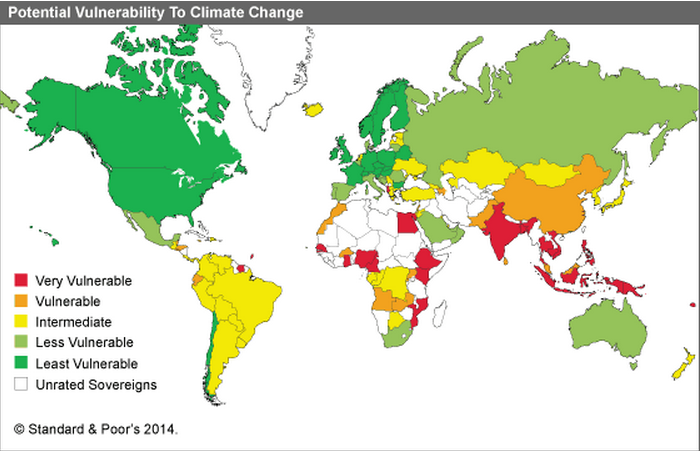 Most of the red countries on the Standard and Poor map lie near the equator, where climate change-caused storms, flooding, and droughts will be more intense, according to media reports. India is particularly vulnerable because of its rising population and depleting resources. A new study shows that China is now India's top trading partner, edging out the United Arab Emirates—India’s previous top trading partner—and is comfortably ahead of the US and Saudi Arabia. India-China annual trade volume now adds up to about $70 billion, and India is running a massive $40 billion trade deficit with China. 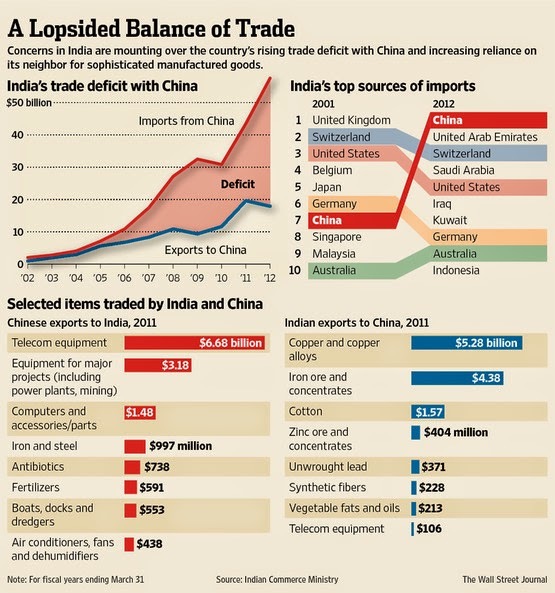 China exports high-value, high-tech machines to India while India exports low-value commodities to China. China's state-owned banks are financing huge infrastructure projects in Africa and India to boost Chinese exports. Leading the effort are China's ExIm Bank, China Development Bank and China Industrial Commercial Bank. Major multi-billion dollar projects being signed by Chinese President Xi Jineng, currently visiting India, and Prime Minister Modi will be financed by loans from one or more of the state-owned Chinese banks.